Ber is a medicinal tree and its various parts, such as leaves, roots, bark, seeds are used from time immemorial to treat wide range of ailments like chronic cough, eye diseases, hair care, wounds and indigestion etc. Ber, desert apple, Indian plum or Indian Jujube is a well-known economical and medicinal tree. Its small fruits (known as Ber in India) are very nutritious and tasty. These fruits contain vitamin C, sugar, minerals, calcium, phosphorus, iron, and carotene, proteins, fat, and carbohydrates. The fruits are also rich in B group of vitamins i.e. Thiamine, Niacin and Riboflavin and beta carotene. Ber fruits are medically proven to be effective in relieving chest pain and vomiting sensation. Ber is a medicinal tree and its various parts, such as leaves, roots, bark, seeds are used from time immemorial to treat wide range of ailments. Medicinally, the fruits of wild variety are astringent, pain relieving, cooling, stomachic and styptic (check bleeding by contracting the tissues or blood vessels). The ripe fruits of cultivated variety are mild laxative and expectorant. The leaves of tree are astringent and causes sweating on oral use. The roots are applied externally on rheumatism, gout and similar conditions. The genus Ziziphus contain about 135 to 170 species, in which 17 are native to India. Indigenous over a wide area, from Southern Europe to South-East and East Asia. Cultivated in China, India, Japan and Republic of Korea. Spiny, deciduous shrub or a small tree, up to 10 m high;spines in groups of two, one straight, up to 2.5 cm long and one curved. Leaves alternate, petiolate, oval-lanceolate, 2–7 cm long, 2.5–3.0 cm wide;apex slightly obtuse;base oblique;margin closely serrulate, with three veins. Inflorescence an axillary cyme. Flowers perfect, seven to eight in each cluster;calyx with cupuliform tube and five segments;petals five, yellow;disk`lining the calyx tube;stamens five;ovary depressed into the disk. Fruits are fleshy drupes, ovoid or oblong, 1.5–5.0 cm long, dark reddish brown when ripe. Irregular furrowed stones are found in tuberculate seed which contains 6 mm long brown kernels of elliptic shape. Important Medicinal Activities Of Ber: Analgesic; Antipyretic; Appetizer; Aphrodisiac; Astringent; Tonic for the heart; Contraceptive; Diaphoretic; Digestive; Expectorant; Haemostat;Laxative; Sedative; Stomachic; Tonic; Vermifuge and can be used as Medicated eyewash. Ber/ Indian plum/ Indian Jujube fruits are nutritionally very rich. They are a good source of vitamin C. Vitamin C performs very important functions in the body. It is required to improve body immunity to fight against infectious diseases. Vit C also required in the body for absorption of iron and keeping gums, teeth, bones, skin, and muscles healthy. Ber are also rich source of vitamin A, B complex and minerals. Vitamin C content of ber fruits is initially low, and increases with maturity of fruit. Ber fruits are rich in calcium, phosphorus and iron. They also contain many essential amino acids. The dried ripe fruit of Ber has laxative properties. The pulp of fruits is also applied on ulcers and cuts. In the case of indigestion and excessive bile, the fruits are mixed with salt and chili peppers and taken orally. 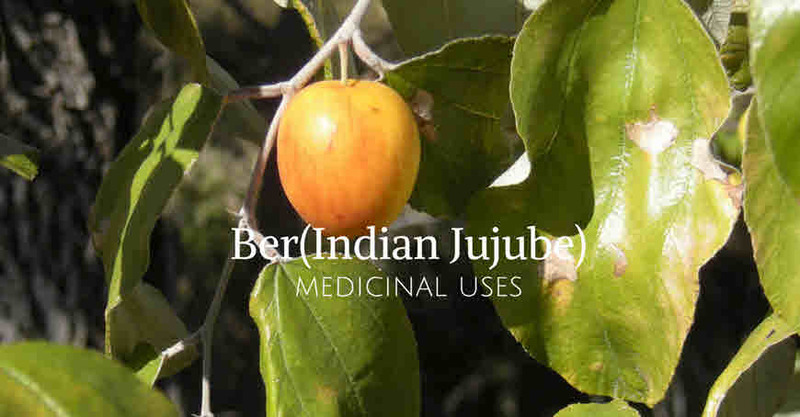 Ber or Indian Jujube is a medicinal tree. It is used to promote weight gain, improve muscular strength, and as an immunostimulant to increase physical stamina. It has antipyretic, diuretic, emmenagogue, expectorant, and sedative properties. The pulp of dried fruit is recommended in Ayurveda for treating burning sensation, blood impurities, excessive thirst and anorexia. In Rheumatism, the paste of leaves and root paste (Ber root + roots of Cassia auriculata ) is applied on the affected body part. Powder of root bark (1g) is taken with 50-100 ml. rice washing water twice a day. In Hair fall, a paste of leaves of ber, amla (Phyllanthus emblica) and neem (Azadirachta indica) is made and applied on the scalp. The decoction of fresh leaves (100-150g in three glass water) can be sued to wash hair. In pimples and acne, the paste of leaves is applied topically. The pounded leave are also applied topically on boils. The poultice of leaves is applied on the affected area. For indigestion, the paste of root (one spoon) is taken orally. The powder prepared from dried Ber leaves is useful in lowering blood sugar level. The decoction of leaves can be used as diuretic. Diuretics are also known as water pills as they increase the urinary output and electrolyte excretion. They are useful in various diseases such as high blood pressure, fluid retention, oedema, acute and chronic renal failure, sciatica, kidney stones, lymphatic swelling, glaucoma, the liver disorders and many more diseases. This herb works as natural diuretic. Natural diuretics work by stimulating the kidney to produce more urine by reducing the amount of water and salts that the kidney reabsorbs into the bloodstream. This improves the functioning of tissues and organs, and also, prevents fluids from accumulating in tissue matrices. The powder of dried fruit is given orally with water to cure diarrhea. In dysentery, the juice is extracted from equal amount of leaves of patharchatta, jamun and ber are taken orally. Dried fruit pulp, devoid of seed—3-6 g;5–7 fruits; stem bark—3–5 g powder, 10–20 g for decoction. For improving milk production in cattle, the dry leaf powder is mixed in fodder and given. In skin diseases, about 150g root is boiled in 500ml of water and filtered. The filtrate is allowed to cool down and applied thoroughly on the affected body part. The treatment is repeated twice a day for three or four days.